On 7 November 2016, the anniversary of the October Revolution, a newly renovated statue of Lenin appeared in the Belarusian capital. The controversial reactions to it culminated in the disruption of the unveiling ceremony. Until now, commemoration of the October Revolution in Belarus has taken place mostly by inertia. 7 November remains a public holiday, reintroduced in the calendar back in 1995. Ordinary Belarusians tend to ignore it: for them it is no more than another long weekend. Only communists and their sympathisers gather to hold rallies and lay flowers at the feet of Lenin monuments. While decommunisation is largely absent from the public discourse, this year some new trends have emerged. Instead of turning a blind eye to the anniversary of the Bolshevik power takeover in 1917, the Belarusian political opposition have started to question the ways in which it is publicly remembered. Soviet monuments co-exist in Belarus with newer memory sites built after 1991, revealing the problematic course of post-Soviet Belarusian national identity formation. As of 2016, roughly 400 Lenin monuments are still standing on the central squares of Belarusian cities. In communist times, only 15 towns in Belarus did not have a Lenin monument. Over the past 18 years, this number has grown by only 16 towns and settlements, where authorities gradually took down their Soviet monuments. The town of Navahrudak in the Hrodna region was the first to remove its Lenin statues. In 1998, in preparation for the 200th anniversary of the birth of Adam Mickevič, a famous native of the town, municipal authorities renovated the central square and took down the old plaster monument without much ado. And yet the decommunisation of Navahrudak ended without having properly begun: the town's central square is still named after Lenin. Other Belarusian Lenins are gradually falling apart due to the effects of time and the low-quality materials used to construct them. Local municipalities often choose not to spend money on the restoration of these Soviet relics. Sometimes, when towns receive funds for reconstruction, they prefer to quietly move their Lenins away from central spots: this has already happened in Niasviž, Dokšycy and Ašmiany. Even though most Soviet era monuments are ignored by the public, the state still maintains a symbolic allegiance to the communist past, at least in the capital. Minsk has yet to get rid of the monument to KGB founder Felix Dzerzhinski, while one of the major squares of the city – Independence Square – has its own Lenin. In 2003, Minsk municipal powers reinstated the old name, “Lenin Square,” to a central subway station which had been known as “Independence Square” since 1992. The opinions of Minsk's inhabitants were ambiguous, and the issue resurfaced again in 2010. Eventually, Minsk city authorities settled on “Lenin Square,” as apparently they received about 30 petitions in favour of keeping the Soviet-era name. In a similar vein, the highlight of this year's celebrations of the October Revolution was the unveiling of the renovated Lenin statue near the Minsk Tractor Works. Originally, this monument stood in an inner yard of the Tractor Works, visible only to employees. In 2016, a group of “veterans of tractor production” successfully negotiated its relocation to a more publicly accessible location. Minsk Tractor Works decided to hold the unveiling on the symbolic day of 7 November. The leader of the Youth Front, Zmicier Daškevič​, along with three other activists, showed up at the rally and antagonised the communists who had gathered there. In addition, activists from the movement “For Freedom,” the United Civic Party, and the Belarusian Christian Democracy also planned a separate rally near the KGB headquarters on 7 November to commemorate victims of Soviet repression. Even though Minsk municipal authorities prohibited the event, a dozen people still gathered near the KGB building. They held candles and portraits of the victims of the Soviet regime along with pictures of people who had gone missing during Lukashenka's rule. The Virtual Museum of Soviet Repressions in Belarus, a civil society initiative established in 2012, offered a public viewing of a film, dealing with the legacy of the communist crimes. It also organised a guided tour to Kurapaty, the site of mass shootings in the 1930s. However, current Belarusian regime does not encourage a broad public discussion of decommunisation themes. Most monuments in Belarus ignore not only the problematic aspects of the Soviet past, but also less controversial events of the 20th century. For instance, the October Revolution is inextricably linked with the First World War, yet monuments to the latter are very rare. Numerous Eastern Front fortifications from the Great War era are suffering from neglect. The WWI memorial near the town of Smarhon in the Hrodna region is still under construction, and its future is unclear. Financed jointly by Belarus and Russia, the Smarhon memorial suffers from fickle political priorities and a lack of funds. The grand opening, planned for 2014, did not take place, although the Belarusian side promises to complete it in time for the 2018 centenary of the end of WWI. As a rule, construction of such significant monuments in Belarus does not involve participation of the public or open dialogue in society. Historians have criticised the WWI memorial in Smarhon for its one-sided interpretation, yet the final project still focuses heavily on the Russian imperial perspective on WWI. It is evident that Belarus remains unwilling to revise Soviet-era practises of commemorating 20th century history. 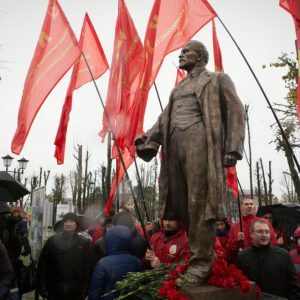 The recent installation of a renovated Lenin statue in the Belarusian capital also shows that Belarusian authorities prefer to maintain the status quo. Most likely, they fear that even the most gradual decommunisation will get out of control. It might unleash forces which could potentially threaten the current regime's stability, as the “Leninopad” in Ukraine demonstrated in 2013 – 2014. Last week's visit by the Russian Minister of Defence clearly demonstrated the Kremlin’s intentions to undermine the image of Belarus as a country with a predictable and neutral military and foreign policy. The confrontation between NATO and Russia, as a manifestation of the New Cold War, has direct implications for the independence, sovereignty and national security of Belarus. There is a risk that Russia will manage to transform Belarus into a Cold War outpost in order to generate conventional and hybrid threats to NATO member states and Ukraine. 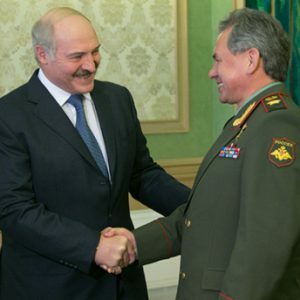 The Kremlin may also destabilise the political and military situation in Belarus if it decides that Aliaksandr Lukashenka is crossing too many red lines. Last week Sergey Shoigu, the Russian Minister of Defence, paid an unexpected visit to Minsk to discuss Russian-Belarusian bilateral military cooperation during a joint board of defence ministries; such a meeting usually takes place only once a year. Nevertheless, the visit was not announced beforehand and seemed to be urgent. During the meeting, he stated that the US and NATO are increasing their offensive capabilities on the western borders of the Union State of Belarus and Russia. He also detailed NATO’s plan to deploy four multinational battalions on its Eastern flank in order to undermine the strategic stability of the region. According to Shoigu, this means that the Union State has to formulate a joint response. Thus, Russia has already taken “defensive” measures against a possible Western threat, and the Kremlin is trying to persuade Minsk to do the same. Without doubt, the Kremlin is trying to increase its political and military clout in Belarus. It involves Minsk in a number of different initiatives such as deploying Russian air, land, and missile bases on Belarusian territory. The formation of the joint military organisation of the Union State (by 2018) and the conducting of joint large scale military drills such as 'West'/'Zapad' have helped Moscow undermine Belarus’s image as an open and reliable partner with an independent, predictable, and peaceful military policy. This also calls Belarus’s intention to behave neutrally in the context of NATO-Russia confrontation into question. Russia began to increase its military capabilities on the Western strategic direction right after the Crimean annexation and destabilisation of Eastern Ukraine. Moscow has already established the first Guards tank army on the Belarusian direction and re-deployed the 20th Guards Army to the Ukrainian border to assist in the hybrid war conflict in Donbas. The Kremlin also plans to form new motorised (mechanised) and tank divisions in the Western military district and one motorised (mechanised) division in the South military district. Moscow is also rearranging the 11th Army Corps in Kaliningrad, providing it with additional facilities to enforce two motorised (mechanised) brigades to division level. According to official statements, Russia is undertaking these military steps as a defensive response to NATO’s increased activity in Central Europe and the Baltic region. The Kremlin will deploy two motorised brigades close to the border with Belarus for this reason as well. One of these is stationed in Klintsy, Bryansk region, 40 km from the Belarusian border, and will be upgraded to a mechanised regiment. The second one is located in Yelnya, Smolensk region, 90 km from the Belarusian border, and will be reinforced to a mechanised division at the beginning of 2017. It is obvious that Russia's measures are disproportionate and superfluous from the point of view of military balance in the region, especially given that Belarus and Russia are still allies. According to statements of the Belarusian military, Minsk does not believe the deployment of the four NATO battalions in Poland and the Baltic states to be a direct military threat to the security of Belarus. These steps will not significantly change the current military balance between Belarus and neighbouring NATO states. According to the Global Militarization Index, Belarus remains among the ten most militarised countries in Europe, placing 12th out of a total of 152 countries, leaving Poland (68), Latvia (85), Lithuania (63), and Estonia (25) far behind. From this point of view, Minsk doesn’t have any reason to be concerned. If NATO's activities on its Eastern flank do not generate a direct military threat even to Belarus, then the same must be true for Russia as well. Nevertheless, the Kremlin has been exacerbating the military situation in the region since the annexation of Crimea using any decision or move by NATO as a pretext. Russia has already conducted sudden readiness checks of its armed forces in the Western military district with as many as 100,000 troops, practising large-scale conflicts with NATO on the Baltic and Scandinavian theatres. The fact that Russia has sent 'Iskanders'– nuclear-capable missile systems — to Kaliningrad, and deployed 'Kalibrs' — capable long range missile warships and submarines — to the Baltic Sea support the fear that Russia may use nuclear weapons in a hypothetical conflict with NATO. This strategy of escalation serves as a tool of pressure and psychological leverage on the EU and NATO; it is meant to undermine the unity and solidarity of the Euro-Atlantic alliance. However, first and foremost this strategy generates security challenges and threats to Russia's neighbours, especially Ukraine and Belarus. On the other hand, Moscow is generating instability in the countries along its border as a mean of reducing the influence of other world and regional powers in those regions. This is a result of Russia being unable to maintain its influence in the region through economic cooperation and soft power. Is Belarus Russia's next target? Obviously, the hardliners behind the destabilisation of Eastern Ukraine and the confrontation with the West perceive the normalisation process of Belarus with the EU and US as a threat to Russia’s influence. For example, Russian military analysts believe that the West will be able to separate Belarus and other Eastern Partnership countries from Russia and draw them into its sphere of influence by the end of this year. Such analysis is problematic, as the normalisation with the West has obvious limits. Moreover, Belarus is not planning to join the EU and NATO or even sign an Association agreement in the foreseeable future. 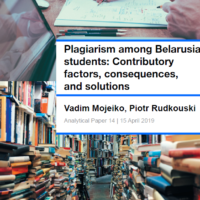 At the same time, such analysis arms the Kremlin with reasons to put more pressure on Belarus. Moscow may even attempt to destabilise the country if it fails to stop its shift towards the West and China or if it loses its political influence following a regime change. Belarus Digest will discuss possible scenarios in upcoming articles. Arseni is the Director of the Centre for Strategic and Foreign Policy Studies based in Minsk and military officer in reserve of the Belarusian Armed Forces.